Thanks for the great comments and votes. 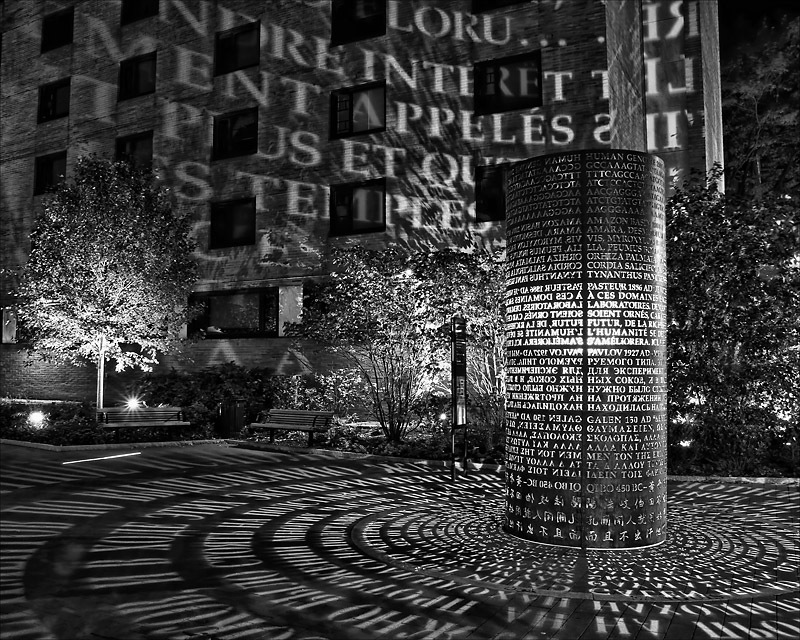 This projected light sculpture is on the campus of Thomas Jeffereson University Hospital in Philly. congrats on the HM Robert! You're making good use of that thing... I seem to remember another challenge it was in, and that shot impressed me as much as this one does. Just a fantastic image of a wonderful environmental artwork. Congrats on the HM! Congrats on your HM. There needed to be four ribbons for this challenge. This certainly deserves one. Had hoped to see this on the front page, but congrats on the HM. Congratulations, love that campus as well. I knew this would do really well! What a GREAT score!!! Congratulations on a supberb top 10.. BTY Where is this and What is it????? Way to go Rob!!! Nice shot and an awesome finish! Very unusual lighting, wonderfully captured. I see that the camera is in the small vertical breakline so it doesn't get flare :) Hope this ribbons. Definitely a cool shot - I like the monochrome approach, and the words displayed on the building and courtyard. Very interesting image. Nice job. This is just absolutely stunning. A photo that made me gasp when it opened on my screen. I have seen photos of this in the daylight, but they are nothing compared to this. One of the few examples in the challenge of a photo that is the better for being taken in the dead of night. Back for another view - definitely my favourite of the challenge - fingers crossed it gets the Blue. Fabulous shot, and it should be at or near the top. Nothing much to say other than perfectly exposed, very creative eye and composition, and sharp. Seems like it should rotate, which would blur it, but no. I also like how you aligned the column with the edge of the frame. Attention to detail, but there was a choice to make and I think you chose wisely. Excellent work. Beautiful image. Looks like it needs a little bit of straightening, or maybe it's my eyes, lol. Interesting exhibit and photo. Great choice on the composition. The words on the building really make this photo stand out. very cool.. where is this? Proudly hosted by Sargasso Networks. Current Server Time: 04/20/2019 04:23:03 PM EDT.